Dharmavaram Ramakrishnamacharyulu was the writer of the play ‘Bhakta Prahalada’, which was later made into a movie and became the first Telugu talkie. He was a well-known playwright of his time, and wrote nearly 30 plays in all. This earned him the title of ‘Andhra Nataka Pitamaha’. Ramakrishnamacharyulu was born in 1853 in Dharmavaram in Andhra Pradesh. As a child, he read a lot of books. His father passed away when he was just sixteen, but Ramakrishnamacharyulu, however, managed to get good education and practiced law later in Bellary. He was very good at cross-examining witnesses and soon became a successful lawyer. He got married for a second time when his first wife passed away. Initially, he used to write plays whenever he could take time off from his profession. He would stage them through an amateur theatre group called Sarasa Vinodhini Sabha which was set up in 1886. It was only much later that he began to get some of his plays published. While most of his plays were written in Telugu, a couple of them were written in Kannada. In some cases, songs or poems would be included as part of the play. Ramakrishnamacharyulu would take immense interest in staging plays, right from the casting to the rehearsals to the actual performance. He also expected the other people involved in the play to treat it with the seriousness that it deserved. He also performed as an actor in some of the plays which he had written, and his plays began to be staged even at the Victoria Public Hall in Madras, and soon garnered great appreciation among audiences there. In later times, a Telugu drama company known as Surabhi performed many of his plays, including Bhakta Prahlada. 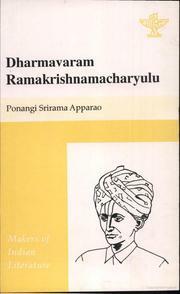 People like Tamil playwright P Sambandham Mudaliar were inspired by Ramakrishnamacharyulu’s work. A theatre in Bellary was also named after this great theater personality. The eminent playwright Ramakrishnamacharyulu breathed his last in the year 1912. ‘Swapna Niruddhamu’, ‘Chitra Naliyam’, ‘Savitri Chitrasvam’ and ‘Vishada Sarangadhara’ are some of the plays written by him.